We wish you joy, peace, love, happiness, and good health. We wish you dreams come true, prayers answered, and wishes granted. I wish you all he best too, Misty Dawn! Happy Saturday to all of you, even the Humbugs! I wish you all the best for 2009 and a very happy and merry Christmas! Have a great weekend and I hope the weather at your place is much better than here! OMD this is a beautiful picture! I hope Santa Paws brings you lots of toys and treats! Thanks for the well wishes for the holidays.From my family to yours I wish you and yours a happy and safe holiday season. Aw Misty Dawn, Thanks Happy holidays to you too. Precious! I wish all the same for you, too, Misty! That is cute... Happy holiday, Misty. Thank you! All the best to you and yours. Misty: Neat card for your CC. awww, thanks, Misty! 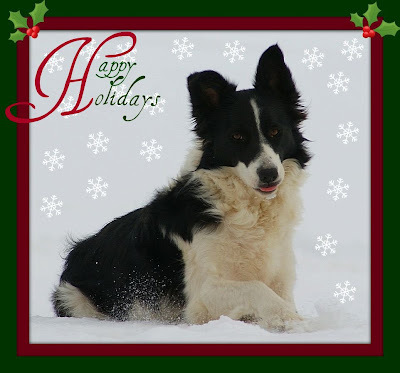 Happy Holidays to you and your family, furry and all! Happy holidays to you, Misty. And thanks for the gift of Camera Critters every week. I love what you did with the picture. Well said and the picture is adorable. I hope we can all heed your words. Best wishes to you and yours Misty. Hope the New Year brings you many blessings - especially with your new job. A beautiful card. Merry Christmas to you too. Thank you so much...and a happy, healthy to you too! Fantastic photo!! Thank you so much for hosting Camera Critters every week. Happy Holidays to you and your family. Look forward to Camera Critters in the new year! this is a cute xmas card! Hi Misty, I love your Christmas card. A great photo and a wonderful sentiment too. I wish you the best Christmas ever and a most Happy and Prosperous New Year! Thank you for Camera Critters too. It means alot to us, so much fun to see everyone's critters. Happy holidays to you too! Very cute picture. Happy Holidays to you too! LOVE your card! You have a cute Holiday Card Misty. Wishing you and Camera Critters the best of all Seasons. What an adorable photo card. Thanks for the wishes and i wish the same for you and yours. May we you all have a great holiday season. Mine so far is full of lots of snow.